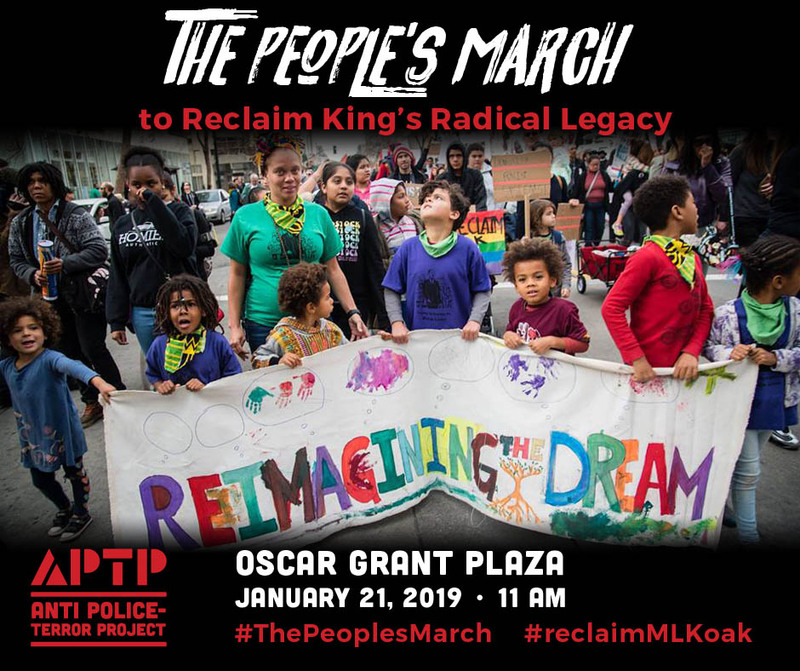 Help us spread the word about The People’s March: The Fifth Annual March to Reclaim King’s Radical Legacy! Scroll down to see sample posts and tweets and our hashtags — and save the images below to share on your social media accounts! WE DEMAND: Justice for ALL victims of police terror and their families. WE DEMAND: Housing as a human right: Truly affordable housing for all in need, immediate shelter for our unhoused neighbors, and public land for public good. WE DEMAND: A just economy that works for everyone, puts people over profits, provides living-wage jobs with dignity for all, requires corporations to pay their fair share to do business in our cities, and ensures that any development benefits the community. WE DEMAND: Community-based public safety: Invest in prevention, not criminalization; make all police use of force transparent and accountable. WE DEMAND: Quality education for all: Fair pay for teachers. No cuts, no closures, no more charters. WE DEMAND: Real sanctuary for all: Abolish ICE; end criminalization of our most marginalized; and guarantee the safety of all queer, Black, Brown, and Indigenous communities. WE DEMAND: Environmental justice: Clean, air, water, and safe food supplies for all. WE DEMAND: Indigenous sovereignty and respect for sacred sites. *Program & March — 11:00 am – 1:30 pm. Family-friendly activities from sunrise to sunset! ● Justice for ALL victims of police terror and their families. ● Housing as a human right: Truly affordable housing for all in need, immediate shelter for our unhoused neighbors, and public land for public good. ● A just economy that works for everyone, puts people over profits, provides living-wage jobs with dignity for all, requires corporations to pay their fair share to do business in our cities, and ensures that any development benefits the community. ● Community-based public safety: Invest in prevention, not criminalization; make all police use of force transparent and accountable. ● Quality education for all: Fair pay for teachers. No cuts, no closures, no more charters. ● Real sanctuary for all: Abolish ICE; end criminalization of our most marginalized; and guarantee the safety of all queer, Black, Brown, and Indigenous communities. ● Environmental justice: Clean, air, water, and safe food supplies for all. ● Indigenous sovereignty and respect for sacred sites.